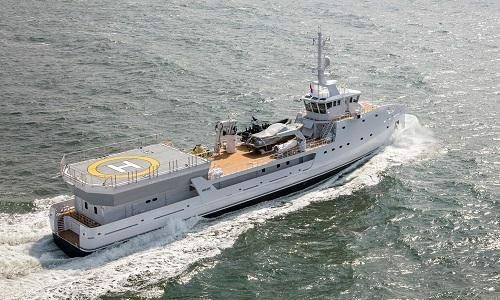 Damen has reported its 69m superyacht support vessel, Game Changer, has completed her sea trials in the North Sea, with an 11.3m tender, 10.5m RIB and U-Boat submersible on her aft deck throughout. The second hull in this particular range by Damen, Game Changer was designed in-house and constructed from a steel hull and aluminium superstructure. She follows on from support vessel 6911 Intrepid, and is now the 11th superyacht support vessel to have been built by Damen. Game Changer’s standout features include 250sqm of open deck space for storing numerous tenders and water toys, using her large deck crane. There is also another 110sqm of space below deck for storage, and she has a fully certified helipad, allowing owners to travel with a large helicopter. Mark Vermeulen, product director at Damen commented, “Our clients want to go to exciting new destinations with less established superyacht infrastructure and they want to have more fun with larger tenders, larger helicopters and submersibles.